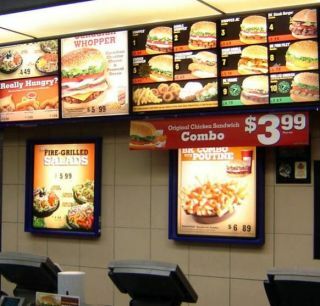 FDA requirements make digital menu boards a "must have"
With FDA nutritional and calorie count display requirements going into effect next year, digital menu boards are becoming a “must have,” not only for QSRs, but also for other establishments that fall under the new federal guidelines. Hangouts are 45-minute panel discussions using Google’s Hangout platform with a moderator and a panel of three or four industry professionals. •The advantages of remote updates to make quick changes.